Hey, hey, hey! I'm baaaaaaaack! Yesterday we talked about briskets, so it's only natural that today we should talk about freezer paper. You knew when you bought that big roast that you were going to freeze part of it for another day. And since you tore off more than you needed for wrapping, how about we die cut some masks with it and see if that's a go. 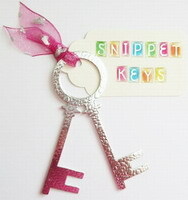 Do you think that was the thought process of the first craftician who came up with this bright idea? I always go through that "what were they thinking" wonderment process, followed quickly by "why dinnit I think of that!" 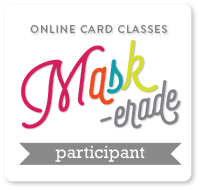 So in yesterday's fabulous Online Card Class Mask-erade, we made masks using freezer paper. I pretty much stole CASEd the teacher's cards, except for different words and shapes and schtuff. The NBUS hugs die is from PTI. Everything else is self-exploratory. Except, PS, and this is true. If you've been following me for a while, you know that covering up all that white space with spritz and smatters and whacks is not my usual style. But it was really fun, so I let it fly. That's when I noticed I had on my brand new LL Bean white summer tee. That's right. Oh, yes I did. It doesn't look half bad in all these pretty colors, but it was a major brain fart on my part! I got the watercolor paper pretty wet before I added my watercolors and the masks held up great! The conversation bubble dies are from Simon Says Stamp. The NBUS sediments are from Paper Smooches (Metropolis and Word Salad) and The Alley Way Stamps (Words to Live By). The glittered enamel dots were brads, but I snipped their legs off because I didn't find them until after I'd attached the panel. In cards, as in life, we all have fails along with successeses. Here's a panel that I heavily misted without success. I love the jewel tones, but when I did The Big Reveal, I discovered major seepage had happened under my mask. This paper won't be a complete loss. I'll use it to make pretty word die cuts. O Key Dough Key, off to my last day of class. Remember, it's never too late to "attend" any of the dozens of classes offered by the mega-talented ladies of the Online Card Classes! See you tamale! Woweeeee! I am in love with your cards, especially the first one - LOVE those fabulous and yummy colours even if you did end up wearing them, lol! Maybe just add a bit more splatter to your lovely white tee and you can then wear your own art! I have read back through the last few posts, and I can see you are turning into a masking wizard! You especially caught my attention with the hand decorated T shirt. 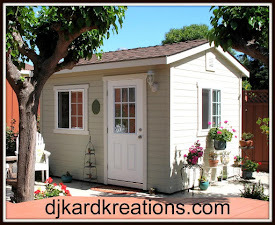 Lovely work, and I am so glad to share farty moments with fellow crafters. Isn't this class so great and fun? Beautiful cards even the one that seeped through which I had a few of too, but mine went in the trash. Maybe, I should dig them out and use with dies too. Great idea. You are definitely on a roll here with the class! Wonderful cards!! I like the idea of using the brads that way ... Clever you ... I'll have to remember that ... Oh and I bet your lovely white Tee shirt looks brilliant and it's an original now! I love these backgrounds! Each one is gorgeous but to be honest, I think my fave would be the one with the seeping... that is so pretty. Brilliant ideas and fantastic techniques Darnell. Can't beat your posts for a giggle too! May we have a photo of the spattered t-shirt! Gorgeous!! !I especially love the "hugs" card. I am afraid to try all that splatter stuff because I know I would make a mess of it. You could always turn you t-shirt into a tie-dye. I hear that is coming back. Those are beautiful cards. And thanks for sharing about the shirt. It's comforting to know I'm not the only one who does this! I love that hugs card. Just breaking myself back into blogging after my poxation. Both are great but I love a bit of splatter (I have a canvas in our bedroom that I splattered, though hubby thinks its more Jackson B*****k than Pollock). Is LL Bean a vegetarian rapper? Your cards are gorgeous! Very trendy looking! Thank you for sharing what you learned - I love seeing what I am missing at the class! Pretty cards. Love the backgrounds you created. Great job on the cards Darnell! Love the splatter, even if it isn't your normal style. It kinda fun to play outside the box every now and then!! The word bubbles were a great idea! Why didn't I think of that??? And I had some trouble on my first two attempts at freezer paper masking too - but finally got it to work. Well, I guess you now have an official flickering and splattering t-shirt to wear when stamping!! I LOVE your first card Darnell, the splattered shirt just might have been worth it. Snap a photo of the T and send it to LL Bean, thy might commission you to do more work them! Pretty colors on the second card too. Looking forward to the word dies made from your boo-boo!! You just keep getting better and better. Lovin' these amazing colors. WOW! I'm thinking maybe I should do that class to see how to use freezer paper for something other than meat! And I'd love to see that t-shirt! I'll bet it's purdy! The cards sure are! Fabulous colors and they are so bright and beautiful. I am sure anyone will be feeling cheery after receiving them. I am just getting into watercolors myself this year. Another friend said the work should be sealed. Do you seal yours? Wonderful cards Darnell, your designs are fantastic and I love the colours. Gorgeous backgrounds and great cards. So glad to see you and your creations in class! Isn't this fun? I'm learning so much. Your cards are very inspiring. I think I'll go "splash" ...now, where's my white tshirt? 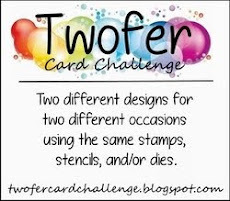 I love when people come up with crafty ideas for using household items to make cards! I cleaned a closet yesterday and found a whole tub of wrapping paper that I haven't used in years, but instead of throwing it out, I'm wondering if it might be useful for envelopes? Whatchathink?? 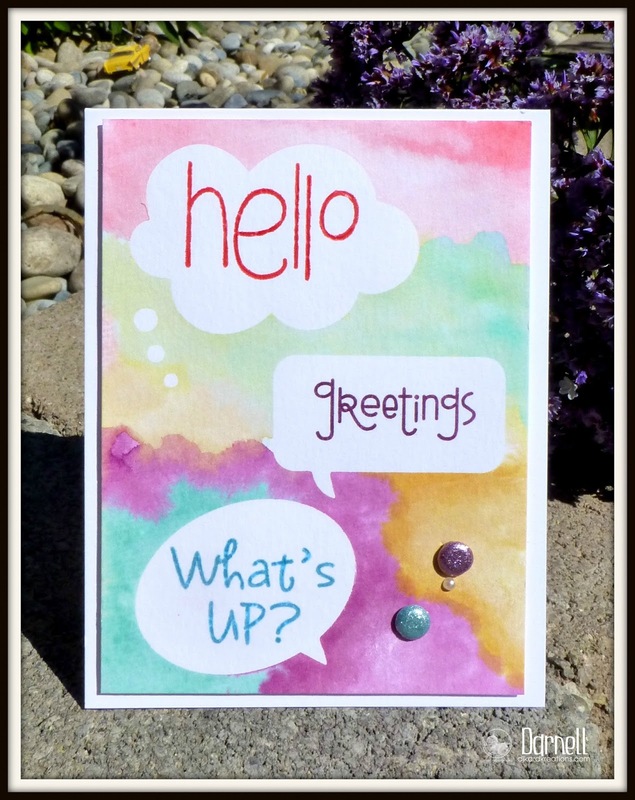 These cards are fabulous and oh so colorful with all the splatters!! So sorry about your new white t-shirt though :( You could always splatter it all over and you'll have a one-of-a-kind shirt that everyone will be asking "where did you get that cool t-shirt?" I'm a brights girl, so these REALLY float my boat. And I ADORE a bit of mess, too. Double float! The top one is my favest of the fave.....closely followed by what you call your fail. The REALLY interesting one.....I do so LOVE a challenge.....I reckon this could make a fabulous card one way or t'other! TFS - enjoying your maskerade!! A+++ on your homework assignments! You are a natural at this splashing & splooshing technique and if your t-shirt (so sad) looks as good these cards, then perhaps it's time to open a street vendor booth and create watercolor T's for $$$. 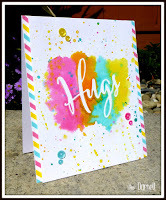 I really like the stripes down the side of the Hugs card - works so well to define the bold focal point. Your second card is my fav of the two. 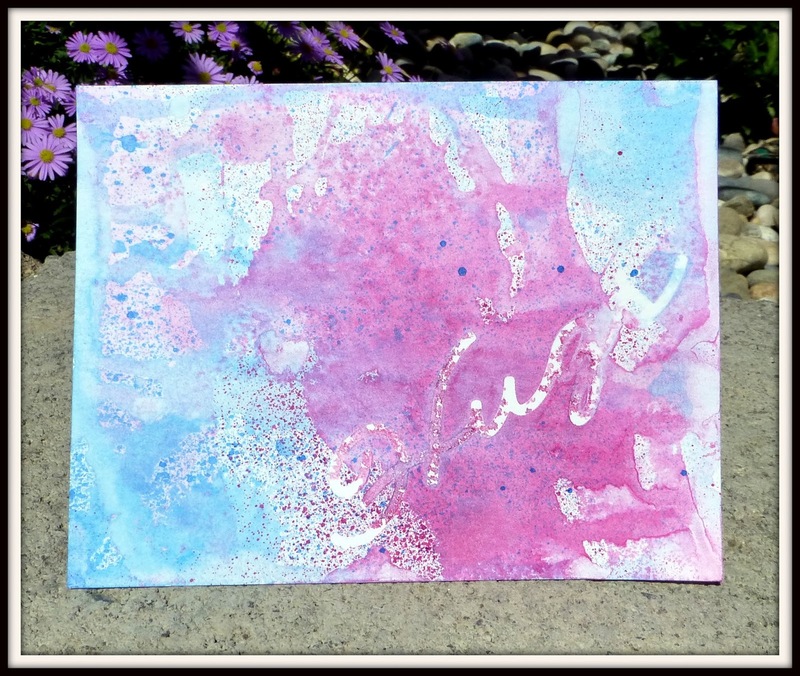 Love the softness of the melded colors and the masked sentiment blocks! Oh wow, these are both wonderful. I love the colors in the first card. I think you should hand deliver that one and wear the matching shirt when you do. The recipient will be so happy to see you match her card. 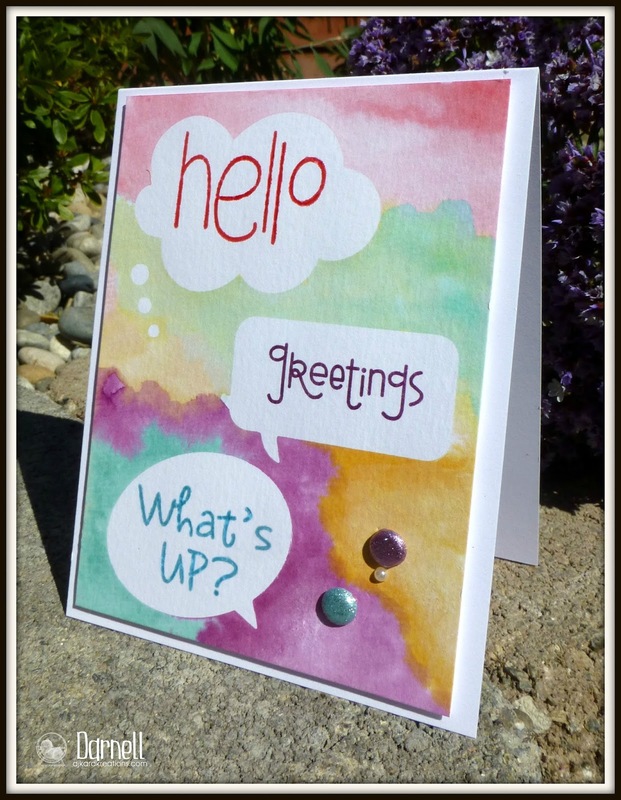 Pretty, fun card with those cute greetings. A great friend card. I watched the 4th day in my jammies and had to get dressed to go to the store and get freezer paper. It is fun to take a class in pj's. School should be so casual. I'm glad to see how well you did with the freezer paper. I can't wait to try it too. Love your cards! And I do the same process - "why didn't I think of that". Well, problem is, I never do so that's we have to CASE! I'm so jealous, Darnell. Card #1 is so bright and cheery and wonderfully done. I tried this same technique and it looks like your fail. I don't know If it wasn't down tight enough or what. I think I'll do what you should do to save it - just cut the die out and stick it over where the paint seeped. Card #2 is great, too. I love the little word balloons surrounded by lovely watercoloring. Freezer paper? Who ever thought of that??? 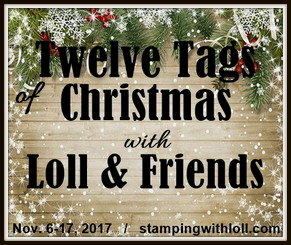 Love your colorful cards and I am glad you are going to use the last one! It's too pretty for the recycling bin! You sure are learning lots!!! Your cards are so pretty! My fave is the first one with all it's cheery colors! Hope the stains come out of your new shirt!!!!! 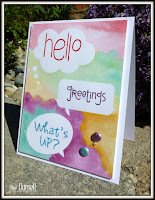 Love the bright summer colors you used on your cards today. You may have spattered a t-shirt, but it sounds like you still had a blast! 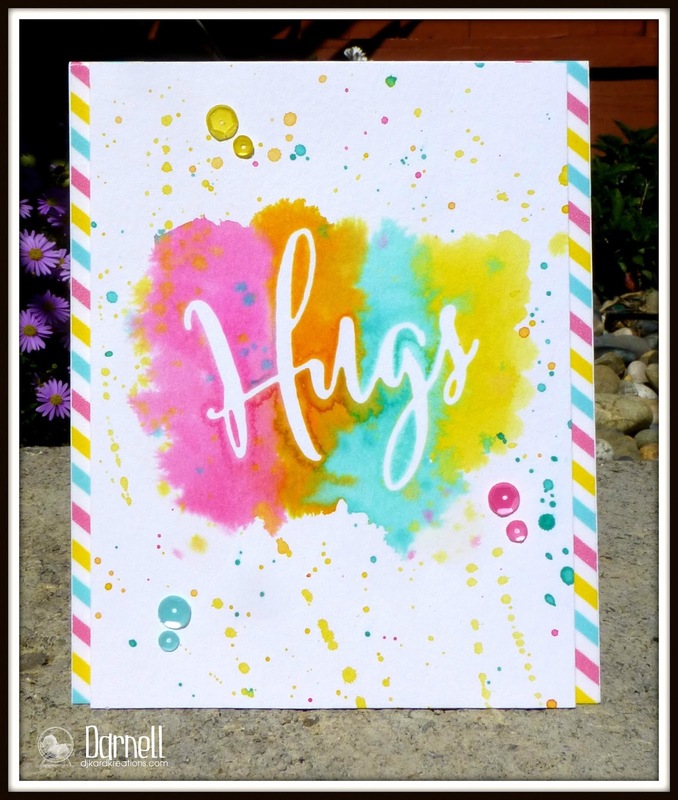 Love these Darnell - especually the 'sucessful' Hugs card - the less sucessful one could also be used as panels on other cards :-) - nothing is ever wasted, it just needs to be used creatively another way!! Awesome cards, Darnell! Especially the first one - stunning, vibrant colors. For your "fail", I would die cut the "hugs" in white and glue it over the partial masked word. This class looks like a ton of fun from the cards you've created, Darnell. Too bad about the t-shirt, but I'll betcha it looks great, too! :D I really like all the backgrounds you created and how great the masks worked. Even the one that didn't work quite as expected can be used later. Awesome! Lovely cards Darnelle and the spatter looks great! I bet your tee shirt looks great with all those pretty coloured splats and maybe decorating clothes will be your next artistic endeavour! I signed up for this class too but haven't had time to watch anything yet so I've enjoyed seeing your homework. Great samples of masked cards Dippy - really love the first one even if it was achieved to the detriment of your new t-shirt!!! Love the way you are keeping the seepage one to use for die cut words - fantastic idea. You are rocking this class! Your Hugs card is fabulous! I really think we should see the pretty T! Awesome flicking! These are pretty . Can only imagine how pretty your tee shirt and the walls behind your seat look. Hope Hammy wasn't too much in the line of fire. Especially all that pink. Hugs Mrs A. Those were all just fabulous, great look! Hope your shirt did not wear too much color. I love the colors and fun your cards showcase!! You are right...who thinks of this stuff...using freezer paper etc!! Boy--you are really nailing the homework, Darnell, & I so love the final card that didn't work--gorgeous colors & will be great for die cuts! Loved both the Happy cards ! That freezer paper is fun huh...I am just a bit lazy...I use a flat iron or curling iron they get hot right?...no clue were my real iron is. Fab cards, and that panel is perfect for die cuts later on. Well done again! Holy awesomness, Batman! LOVE these, Darnell! They are both so bright and happy! I gotta say, I'm still trying to figure out how you got the masking to work so cleanly for you! That first card is SO happy! I love it! I loove your cardcreations!! Great vibrant colours just stunning cards! Very neat technique...love the results. Love your cards, hespecially the first one. So bright and splashy. Dont know what freezer paper is but it looks like it worked brilliantly. How many crafting ladies could honestly say they dont have a bit of craft glue, paint, glitter, marker etc attached somewhere on every piece of clothing (outer of course) they have???? Gorgeous, color infused, bright, and amazing cards you have created - you get an A+++++++ on your homework and I love the first card most of all because of all the bright, happy colors - the side borders and the sequins are such a nice touch to that card!! So super impressed!!! Just catching up on all your (and Hammy's) homework. Seems like you both really enjoyed the class :) I love this colourful splattery card (well I would, wouldn't I?). Oh my gosh thes are stunning! Love that first one! Love the backgrounds ...well maybe not the messed up one but I know you could still use it with something on top,hope you saved it. Yes I know what you mean about saving part of the roast :) and you cut too much paper do it all the time. Hahahahhahaha...the image of you wearing your splattered white t-shirt has my in hysterics. Sorry...but way too funny! Fun cards - even the one that had a little design innovation and will find itself showcased with its friends in due time, in a unique way! Yikes on your new now not so white tee. I really like the splatters on the first card. Such a lovely color combo. I am so impressed by the crisp lines you got with the masks on the second card. Such a pretty combination of colors. These cards are all so lovely, Darnell!!!! You really had fun, hey, maybe you should start designing t-shirts now, while you're busy with your cards!!!! Someone forgot his toy outside!!!! - spot it in the 2nd card photo!! !